acknowledged that this holy Jewish site was part of Israel. Jerusalem, Israel — May 22, 2017 … It was a day filled with history as the first sitting US President stood by the Western Wall and placed a note inside. President Trump’s arrival at Ben-Gurion Airport was a festive one. Smiles, speeches and handshakes for all the Israeli dignitaries was followed by a helicopter ride into Jerusalem. “President Trump, Donald, Sara and I are absolutely delighted to welcome you and Melania to the Prime Minister’s residence in Jerusalem, the eternal capital of the Jewish people, the united capital of the Jewish state,” said Netanyahu. 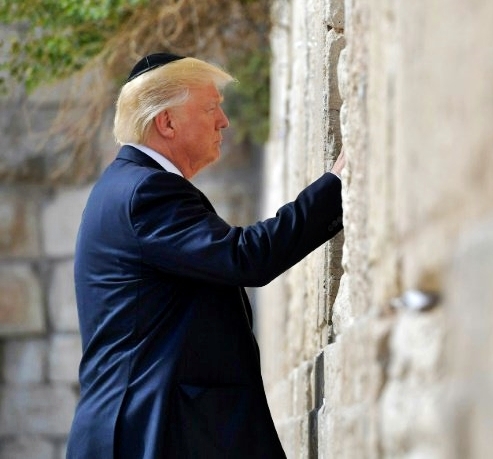 Trump, since becoming President, has never acknowledged Jerusalem as the capital of Israel and his White House staff has stated that the Western Wall was not a part of Israel. Netanyahu’s opening statement spoke volumes illustrating the differences that presently exist between the US and Israeli delegations. “We’ve known each other for many years, and it’s always good to see you. But it’s also wonderful to see the blossoming friendship between our two beautiful wives, Sara and Melania. You’re so welcome here and we’re so pleased to see you. We’re honored to have you in our home. You’ve been today Mr. President to the Western Wall, one of the holiest sites of Judaism. You’ve been to the Church of the Holy Sepulcher, one of the holiest sites of Christianity. We protect the Christian sites as no one else does anywhere in this region. We protect Christian sites, Muslim sites, obviously Jewish sites. We’re committed to the freedom of all faiths and to the rights of all. We had a terrific discussion today, and when I say ‘terrific,’ it encompasses everything. We could talk about deregulation, we could talk about economics, I think we quote each other, we understand each other, and so much of the things that we wish to accomplish for both our countries. But I want to thank you especially today for your deep commitment to Israel’s security, its well being and its future. I have no doubt that as we work together, you and I, the alliance between our countries will grow ever stronger. I look forward to working closely with you to confront the dangers we face together in this violent and volatile Middle East. I believe that together we could roll back Iran’s march of aggression and terror in this region and we can thwart Iran’s unbridled ambition to become a nuclear weapon state. I also look forward to working closely with you to advance peace in our region, because you have noted so succinctly that common dangers are turning former enemies into partners. And that’s where we see something new and potentially something very promising. It won’t be simple, but for the first time in many years, and Mr. President, for the first time in my lifetime, I see a real hope for change. The Arab leaders who you met yesterday could help change the atmosphere and they could help create the conditions for a realistic peace. These are all great signs on your historic visit. It’s a visit that I think has echoed down the ages because the late Abraham Lincoln is reported to have said that there was no city on Earth that he so much desired to see as Jerusalem. Well. Mr. President, Donald, there is no city on earth where you are more welcome than right here with us in Jerusalem. President Trump responded: “Thank you very much and it’s a great honor to be with my good friend, Prime Minister Netanyahu, and of course Sara. Thank you, and also thank you for that beautiful tour. Melania’s still talking about it. Thank you very much. Trump continued: “During my travels, I have seen many hopeful signs that lead me to believe that we can truly achieve a more peaceful future for this region and for people of all faiths and all beliefs and frankly all over the world. In my visit to Saudi Arabia, I met with many leaders of the Arab and Muslim world, including King Salman, who treated us so beautifully, and really wants to see great things happen for the world. He really does. I got to know him well, and he really does. These leaders voiced concerns we all share about ISIS, about Iran’s rising ambitions and rolling back its gains, and about the menace of extremism that has spread through too many parts of the Muslim world. I’m encouraged that they pledged cooperation to confront terrorism and the hateful ideology that drives it so hard. Trump concluded: “Our deep and lasting friendship will only grow deeper and stronger as we work together in the days ahead.